No, all online videos are only available for streaming. This allows you to have access to the videos in HD quality without having to download them to your computer. Once you are enrolled in a course you will have unlimited access to the video lessons 24 hours a day. For the Pentatonic Foundation and Blues Foundation Courses, you have the option at checkout to add DVDs to your order for an additional $15. They will be shipped to your address (almost) anywhere in the world. Do you ship DVDs or books to my address? Yes! 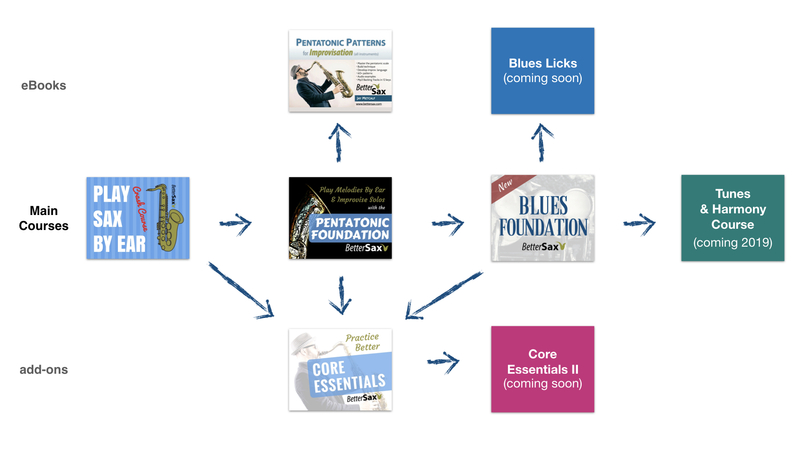 The Pentatonic Foundation and Blues Foundation Courses are available on DVD. On the checkout page, you simply need to check the box to add the DVD option for an extra $15. 2 DVDs will be shipped to your address (almost) anywhere in the world. Once your payment is completed, you will have instant access to your purchases online in either case. Start learning immediately! I don't read sheet music at all. Can I take this course? Yes! The Pentatonic Foundation and Blues Foundation Courses are designed to be done almost entirely by ear. You don’t need to know how to read music at all. You will probably learn a bit of music reading as you go through the courses, but it is not necessary. The Pentatonic Patterns for Improvisation and Core Essentials Courses can also be done by ear, but they are designed for those who have basic notation reading skills. I've never played without sheet music. I'm worried that I can't play by ear. Can I do this? Yes! And you definitely should try it. Reading sheet music can really hold us back in our ability to play what we hear in our head and be expressive with music. Student after student tell me that they were totally amazed at what they were able to accomplish by following this method. Check out my article on playing by ear. I’ve been playing for a while, is this course right for me? I’m a beginner. Can I take this course? Yes. Beginners who already know how to get a decent sound and play most of the notes on their saxophone can take the Pentatonic Foundation Course course. I recommend starting with my free Play Sax by Ear Crash Course to get an idea if this is right for you. What I teach in these courses will be useful to you for as long as you play music. How long it takes for you to go through all of it depends on your level, and how much work you put into the material. Everything you learn in here can be improved upon in an unlimited number of ways, so in reality we never really finish. I recommend going through the courses more than once. Each time you will understand the material more thoroughly and reach another level towards mastery. Is this course for any type of saxophone? Yes. All the courses can be used with any saxophone. I play a different instrument than saxophone. Can I still learn from these lessons? Absolutely! These lessons can be used by clarinetists, flutists, brass players, and more. Much of the instruction is geared towards wind instruments, but all of it is practical no matter what you play.